Bed and breakfast in Great Malvern. It is estimated the Malvern hills are 650 million years, and are particularly imposing as they rise from an otherwise flat landscape. Malvern is also famous for its water and its use in Hydrotherapy treatment. In Malverns town centre the ancient Priory boasts a collection of medieval tiles. The Morgan Sports car is still built here. Malvern has a first class theatre. Malvern holds its market on Fridays. If you are in the right town but cannot find the accommodation you want on this page, you might consider Great Malvern hotels. Set in 2 acres of its own gardens, this stunning 17th century property enjoys spectacular views of the Malvern Hills, the beauty of which is timeless. A warm welcome awaits you when you enter the cottage through the pretty plant-filled conservatory into the old oak beamed hall with original cast iron features. The dining room serves an award-winning menu which incorporates the use of the finest seasonal produce, along with homemade rolls, ice cream and petits fours. Situated just 2 miles from the three counties showground, the hotel is an ideal centre for those wishing to visit the Cathedral cities of Worcester, Hereford and Gloucester. For lovers of the countryside, the Wye Valley, Forest of Dean and the Cotswolds are all within easy touring distance making this an ideal centre for enjoying the heart of England. Occupying a central location within Great Malvern's town centre, this characteristic Queen Anne building offers a warm and friendly welcome to all of its guests. Unwind and enjoy the beautiful Town and Countryside in Malvern. With numerous picturesque towns and villages to explore, as well as the local festivals and events, Malvern will give you reason to return time and time again to The Mount Pleasant Hotel. Originally built in 1730, with the new wing being built in 1850, the hotel's restaurant has recently been refurbished to offer a modern kitchen serving an extensive Ã la carte menu. Nestled amid mature grounds in the rural hamlet of Gilberts End, just outside the beautiful Riverside Town of Upton-upon-Severn, this charming farm house is set within a splendid Grade II listed building. With parts dating back over 600 years, Gilberts End Farm offers comfort and tranquility steeped in history. On the edge of the Cotswolds, this characteristic farm presents itself as the ideal base to explore this area of outstanding natural beauty, including the historic towns of Stratford-upon-Avon, Tewksbury, Malvern and Worcester. For business stays, the farm is commutable from Birmingham, Bristol and Cheltenham. Furthermore, all of the rooms feature comfortable sitting and working areas and unlimited free wireless internet connection. This beautiful family-run Victorian hotel was built in 1851, retaining its original charm and character with the added luxury of modern amenities. The Cotford Hotel is just a few minutes' walk from Malvern Town Centre, the theatre, cinema and hills, but is set away from the road in its own beautiful, mature gardens. Guests are entitled to complimentary use of the Malvern Splash swimming pool and sauna. All of the bedrooms are en suite and non-smoking and feature many facilities. The restaurant is of a high standard, offering fresh, home-made food, with a varied menu which changes frequently. Other facilities include a comfortable lounge, bar and ample off-road parking. Set in 7 acres of wooded slopes, Cottage in The Wood offers an award-winning wine list, homemade biscuits and free parking and Wi-Fi, with direct access to the Malvern Hills. The Cottage in The Wood offers views across the Severn Valley, just 3 miles from Malvern, and has been described by The Daily Mail as 'the best view in England'. The Outlook Restaurant has 2 AA Rosettes, a well-stocked bar and a list of 600 wines. The cosy lounge features a log fire in winter, and an impressive collection of different whiskies and gins. All rooms are en suite with free toiletries and free access to a video library. Rooms with views also have binoculars. The Abbey is situated at the foot of the Malvern Hills in the Worcester countryside and is convenient for many attractions. Its history dates back to the 1600s and the building retains some outstanding original Victorian architecture. Located in the heart of Malvern, The Abbey offers outstanding Victorian architecture beneath its Virginia Creeper clad facade. Commissioned during the growth of the spa town in the mid 19th century, the hotel has a long history of welcoming guests and provides the highest levels of comfort demanded by today's traveller. The location offers easy access to the M5, M6, M42 and M40 and convenience for Birmingham's NEC and airport. Great Malvern Station is a mile away, with direct links to Paddington station. Enjoy the fine English traditions of service and hospitality for which The Abbey is renowned. 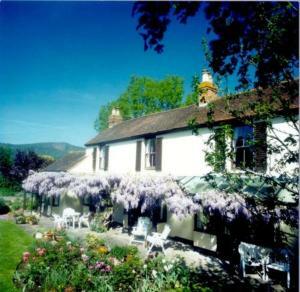 Bed and breakfast near Great Malvern. 2 miles south of Malvern. B&B.